Frederick Fennel, a giant in the wind ensemble idiom, director of the Eastman Wind Ensemble and a longtime supporter of the drum corps activity, passed away this morning in Florida. Fennell was released from Sarasota Memorial Hospital yesterday, and returned to his home in Siesta Key, Fla. Fennell had experienced severe and irreversible heart damage. An enthusiastic drum corps fan, Fennell attended the DCI Cinema event in Cleveland on Aug. 5, 2004. Fennell was slated to be guest conductor of the Ithaca College Wind Ensemble in Ithaca, N.Y., tomorrow, and the Ithaca College Concert and Symphonic Bands on Thursday, December 9. More details to follow. 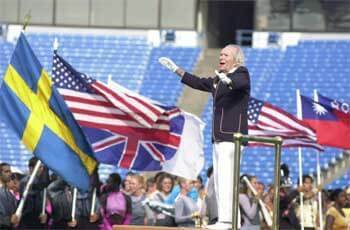 Frederick Fennell conducts the combined corps in 2001.